FOR many of us who are ardent non-vegetarians, salads seem to be very tasteless basically because they dont have something non-vegetarian. 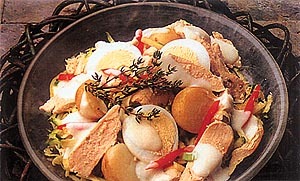 It is not necessary for salads to be purely vegetarian, as many chicken and seafood salads are popular around the world. Also the combination of chicken or shrimp etc with different vegetables and a variety of dressings is a welcome change from the monotony of the same old dishes we tend to eat day after day. Boil the chicken and shred it into bite-sized pieces. Cook the eggs till they are hard-boiled. Peel the cucumbers and grate them fine. Slice the capsicums into long slender slices. Boil and peel the baby potatoes and cut them into halves. Chop the fresh coriander and keep aside. In a bowl add the cooked, shredded chicken, grated cucumbers, sliced capsicums, and boiled, peeled and halved potatoes and mix well. Add in the mayonnaise and season with salt to taste and freshly ground black pepper. Best if served chilled. Cook the pasta in boiling water with salt added to it till it is cooked but still firm to the bite. Drain in a colander and allow it to cool. Cook the prawns in a little olive oil and season with salt and pepper and put it into a bowl. Drain the tuna from the brine or oil in the can and flake it with a fork till it is separated into bits. Chop the cabbage or lettuce and the capsicum into small pieces and place in a serving bowl. Add the cooled, cooked pasta cooked shrimp, and the flaked tuna to it. In a separate bowl add the remaining olive oil, mustard, chopped oregano and parsley, sour cream and salt and black pepper and mix it all well. Whisk it with a hand-held whisk till it is well mixed and then add this dressing to the salad just as you are ready to serve it. Cut off the broccoli stems and boil the rest in salted water for about 10 minutes. Rinse them well in cold water and drain. Boil and shred the chicken and keep it aside. In a pan add in olive oil, chopped spring onions and crushed garlic cloves and cook for a few minutes. Add in the lemon juice and salt and pepper to taste. In a bowl mix the cooked broccoli and chicken together. Add in the salad dressing and mix well.